Paul is kind of a big scaley Falcor (from the Neverending Story). 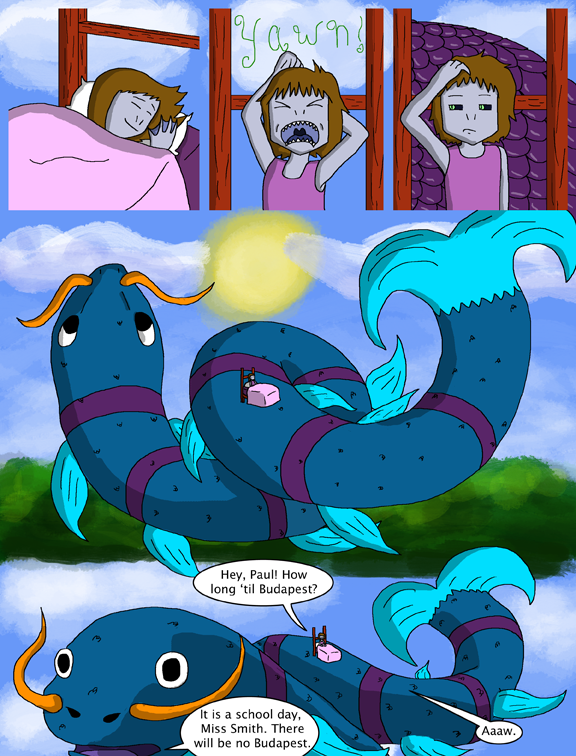 Stupid flying dragonfish and their strictness. I love this. And they’re so formal, too. Lighten up, flying dragonfish. How the heck did the bed stay there? Know what, forget it. I’m just going to go with it, and have a drink. Oh! I knew from the first frame it was going to be a “Little Nemo” tribute! Nice! Oh great, great catfish in the sky, When, oh when, can I have a pie? I believe that is from Perfect World International. What is this…I don’t even…NO. I’m just going to roll with it and assume an explanation will come later. Nice fan art! As for the strip, I LOVE the yawn! By the third panel I was wondering what those blue scales or house shingles might be and by the fourth I was like… Miyuzaki film? Hee hee! So awesome, Dave! Oh, and nice use of the gutters! I’ve never seen you go all out like this one. Very creative, Dave! So. Would they have taken the Danube, or would they have flown? I’m fairly certain this is a dream haha however we know next to nothing about our heroine’s origins there could be some memories in there. … Is it just me or is her speech different as well? 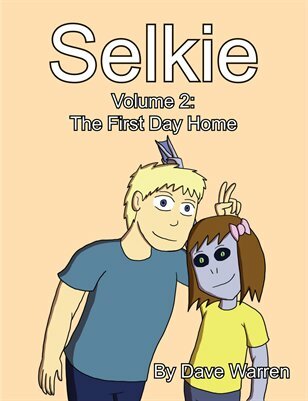 -this is how Selkie wants to be able to speak! So, Dave, just how slow am I? Scale of 1 to 10? You´re right. She´s probably dreaming in her native language – if you go back to those strips, she doesn´t do the “s” thing in her native language. I just reread this (I have a day off work, and have been going through the archive) and I suddenly noticed that in her dream, Selkie doesn’t speak with extra s sounds. Interesting. ….I know this is kinda odd, but could you please make Paul a recurring dream character? Something about him is just awesome.